We’re launching a new Event Management Module in Beta. 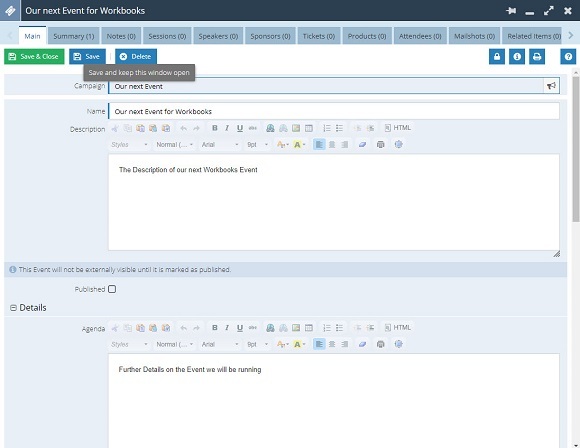 The Event Portal is a new addition to the Workbooks Product, offering a comprehensive event platform that will allow you to manage all aspects of a Marketing event from within Workbooks. 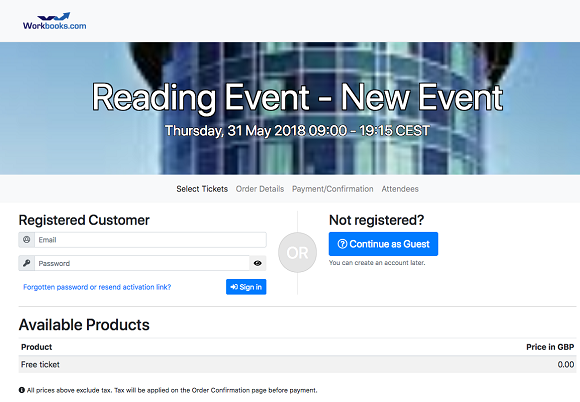 This includes access to an Event Portal where attendees will be able to register their interest in an event and purchase tickets, the Order for tickets is created automatically within Workbooks and can be sent straight to the Customer. Events are a new Record Type that will be a core part of our enhanced Event Portal. The events functionality will be a chargeable module and requires an existing business licence. If you would like to join the beta for the Event Management Module then please register your interest via support@workbooks.com. 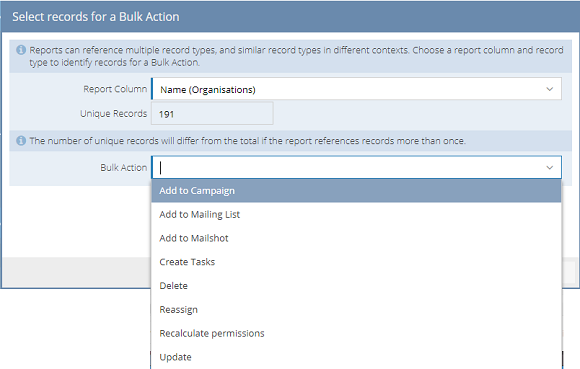 You can now perform Bulk Actions on records within Reports, which allows you to perform actions, such as adding members to campaigns, whilst using the power of reporting to select records. A report may return several types of record in each row e.g. Cases, People, Contracts etc. 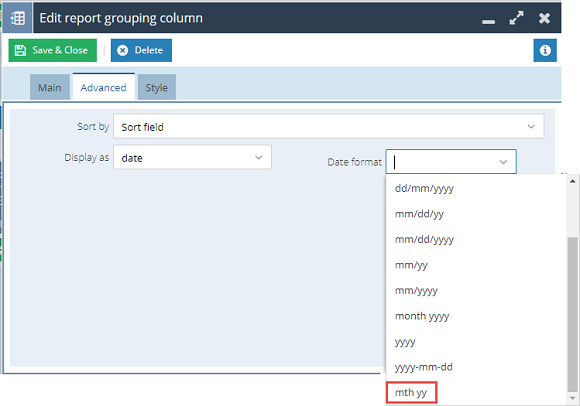 You can choose which record type the bulk action should be run on by choosing a column in the report that is associated with that record. This will then calculate the number of unique records and prompt you to select what Bulk Action you wish to perform on those records. The list of Bulk Actions available in this list is similar to the set available on the Landing Page for that record type. We have added an additional format option to the Date format picklist. The ‘mth yy’ format will output a date as a short month and short year e.g. Jan 18. You can now quickly switch who a report will Run As using the Bulk Actions > Update option on the Reporting Landing page. 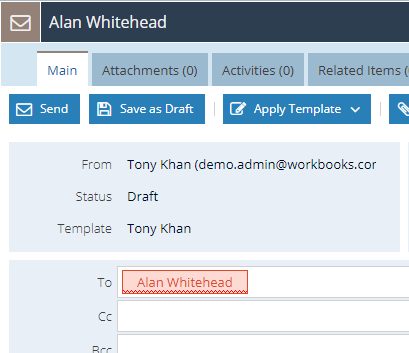 This is particularly useful if you have a report running as a user who is no longer active within Workbooks as it will display no items in the report. A new ‘Load Preview’ button will now appear in the Preview pane when editing a report. This has been changed to prevent reports from being run unnecessarily if you are just amending columns. This is particularly useful for complex reports that have to process lots of data and takes a long time to run. We’ve added a new database setting to support ‘GDPR Mode’. Enabling this setting will work alongside Compliance Records to help prevent you from emailing any People or Leads in your database unless they have a valid Compliance Record. GDPR Mode will also apply to mailer integrations (Gator, MailChimp, Dotmailer), so only Compliant members will be synced. 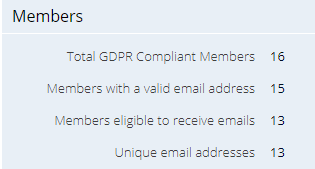 On Mailing Lists, Marketing Campaigns and Mailshots, the members/recipients can be filtered by GDPR Compliance, and the Statistics tab will also reflect this. Any custom fields which have been created on a Compliance record will now be available when generating a Web2Lead Form for your website. In addition to filtering on GDPR Compliance, you can also filter on the Channels and Special Categories columns on People, Sales Leads, Marketing Campaigns, Mailing Lists and Mailshot Landing Pages. This will enable you to quickly identify People or Lead records in these categories. The Revoked? Field is available on the Compliance Landing Page and enables you to distinguish between Compliance Records which have simply expired vs those that have been intentionally revoked. It is now possible to hide the Purpose picklist on the Compliance Record’s Form Layout. You can also amend, add and remove values from this and the Legal Grounds picklists. Workbooks provides the choices in the Legal Grounds picklist as defined in the EU's General Data Protection Regulation. Some of these values may not be appropriate for your business, so you can remove them but you should ensure that you remain compliant with the regulations. We have also provided choices in the Purpose, Special Categories and Channels picklists that are most likely to be useful to you. You can add and remove choices to suit your business in accordance with the regulations. We’ve created a new section which can be added to your Online Activity form layouts to display the survey responses from a GatorSurvey in a cleaner format. This will be hidden by default, so you will need to enable the ‘Survey Response’ Section on the Form Layout if you wish to see it. Online Activities will already relate to People and Organisation records if the Domain or Email Address matches. This has been enhanced further, Survey Responses can now be related to Workbooks objects by adding Object Reference parameters to the survey URL. The parameters should be prefixed "gsv_" with an Object Reference as the value. For example, the parameter "gsv_wb_campaign=CAMP-123" will relate the Survey Response to the Marketing Campaign with the Object Reference CAMP-123. We’ve differentiated between the ability to ‘modify’ a Transaction Document from the ability to ‘Post’ one. We’ve added the ‘Allow to post documents’ to all User Groups which currently contain a ‘modify’ Capability for a transaction document type, so all users continue to have the same features currently. This allows you to grant the Capability to modify Transaction Documents to user groups, without also giving them the Capability to Post documents too. When a document is copied using the API using the copy_from field, any additional attributes specified can set values in the newly copied document. This means that you no longer need to make multiple calls via the API to copy the document and then update it. We’ve improved the workflow around Lead Conversion so that it always displays the list of potential duplicate records. This will improve awareness of duplicates, and reduce the likelihood of them from being created. 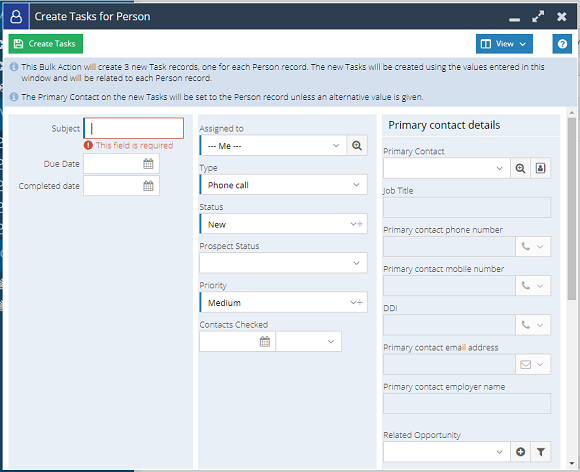 You can control whether the Create a new Organisation and Create a new Person checkboxes are ticked automatically for your users via Start > Configuration > Database > Database Settings. Unticking these checkboxes can encourage a user to pick an existing record rather than create a new one. In addition, when a Lead is converted and the Lead does not include an Organisation, the prospective customer of the opportunity will now be automatically set to the person. If the Lead includes an Organisation, the Organisation will become the prospective customer as before. We’ve added Audit Records for the addition or removal of members on Campaigns, Mailing Lists and Mailshots. This will audit a single or bulk action, and the bulk action will also appear on the Bulk Actions Landing Page. We’ve added the Default Price and Default Cost columns to the Components Grid on Products. This allows you to easily see what these default values are without having to open the product component to check. You can now Create Tasks using Bulk Actions on a Landing Page and Campaign/Mailing List members. 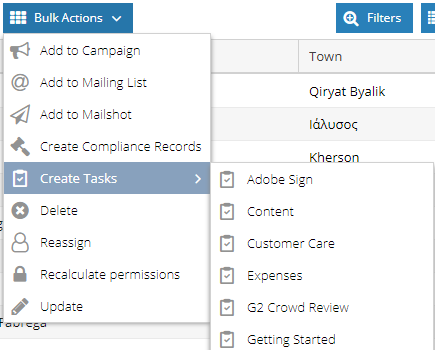 To allow your users to do this, you’ll need to grant them the ‘Bulk create tasks’ Capability. If you have multiple Record Templates available, you are given the choice of which Record Template you wish to use. It will then display the Record for you to complete the values, as required. Note: When used on a Lead or Person Landing Page, the Primary Contact will default to the Person or Lead record, so you should leave this blank unless you want it to be the same for every Task created. You can now create Form Layouts for Emails. You are presented with two options when creating them; Editable or Read-Only. You can also utilise Form Layout Rules to display a different layout based on values on the record. In February this year we made the Modern UI available on Phones as an open beta. This new UI on Phones provides you with a feature rich version of Workbooks, and includes all of the commonly-used Desktop UI functionality on a mobile device. Due to the positive feedback we’ve received over the last few months, we’ve now removed the ‘Beta’ label on the mobile and tablet versions of Workbooks. To access the new phone UI, you will simply need to visit https://secure.workbooks.com/login or www.workbooks.com/login and it will detect whether you are using a phone or tablet automatically. We’ve increased the number of fields available in API data from 20 to 40.